​The Richard Burton Online Museum was conceived and created on August the 5th, 2012 the date which marked the 28th anniversary of the passing of Richard Burton C.B.E. The iconic photograph of Richard Burton in profile overlooking the Bridge at Pontrhydyfen, Y Bont Fawr, which features as a header image on some of the Richard Burton Online Museum's pages, appears on this website with the very kind permission and approval of 'The South Wales Evening Post', an allowance for which we are extremely grateful. The Richard Burton Online Museum, as with any physical museum, is constantly adding new items which we feel are of interest and importance to the collection, as well as updating images and information after careful and intensive research. This we feel, keeps the Richard Burton Museum fresh and interesting to old and new visitors alike. Our gratitude also goes to the Neath and Port Talbot Borough Council for their help, encouragement, advice and support, in particular Gemma Hargest, who has helped to promote this site from its inception in 2012. We would also like to thank the many biographers of both Richard Burton and Dylan Thomas, whose individual works have been of invaluable assistance to us during the research for this site and without whom we would have been at a loss for accurate dates and information, namely;. Jeff Towns, Professor Chris Williams, Melvyn Bragg, Tom Rubython,Tony Earnshaw, Hilly Janes, Andrew Sinclair, Andrew Lycett, Penny Junor and BBC Genome to name but a few. A special mention must also go to the various individuals who in their own special way have given advice, support , encouragement and inspiration from this sites conception and continual development; Gwen Watkins, Andrew Dally, Geoff Haden, Matt Hughes, John Bethell, Aled Betts from the National Library of Wales, Rachel Moses from The South Wales Evening Post and all those who follow the Richard Burton Museum on Twitter. 7th January 2019.........Updated in 'Richard Burton Film Library'. 13th January 2019.......Updated in 'Burton Books and Magazines' Text, Layout and Images. 27th January 2019.......Updated in 'The Recorded Burton Voice' Text, Layout and Images. 23rd March 2019.........Updated in 'A Dylan Thomas Treasury' and 'Burton Books and Magazines'. 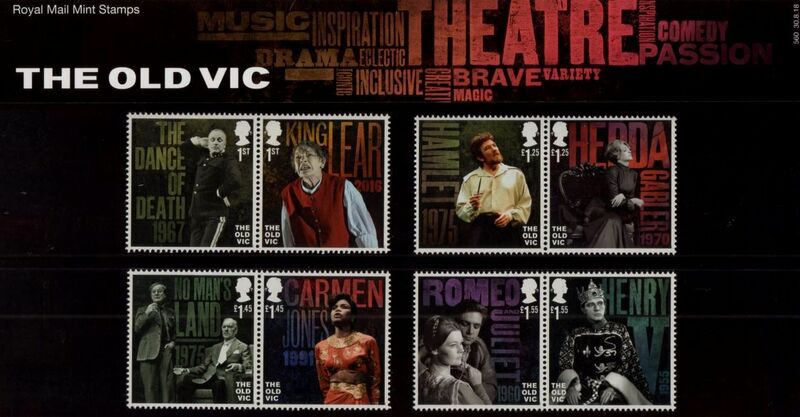 To mark the bicentenary of The Old Vic, one of the most important theatrical v venues ever built, the Royal Mail have issued a set of stamps in order to commemorate this historic event. This first day cover, issued on the 30th of August, consists of eight beautifully designed stamps, each one featuring an actor of great merit in an role of historic importance which was at one time performed at the Old Vic. The Dance Of Death, 1967. Written by August Strindberg and starring in the lead role, Laurence Olivier. ​ King Lear, 2016. William Shakespeare's Tragedy, directed by Deborah Warner and starring Glenda Jackson. Hamlet, 1975. Albert Finney was to take on the role of the troubled Dane in this Old Vic production, directed by the great Sir Peter Hall. Hedda Gabler, 1970. This historic Old Vic production, combining the mighty talents of Dame Maggie Smith and Ingmar Bergan, was based on the work by Henrik Ibsen. No Man's Land, 1975. Written by Harold Pinter, this stamp features an image of the two Knights of the English stage, John Gielgud and Ralph Richardson in a scene from the play, the Old Vic production was again directed by Sir Peter Hall. Carmen Jones, 1991. This Old Vic production was written by Oscar Hammerstein II and featured Sharon Benson in the title role, directed by Simon Callow. Romeo and Juliet, 1960. Dame Judi Dench and John Stride were to appear as the star-crossed lovers in this Franco Zeffirelli production of the William Shakespeare play. ​Henry V, 1955. 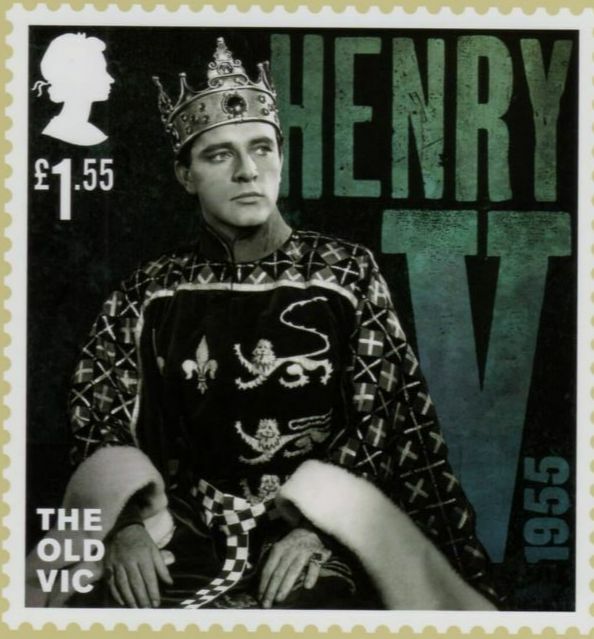 This stamp features Richard Burton, magnificent in the role of Henry V. The Old Vic production was directed by Michael Benthall. This collection of outstanding Royal Mail stamps were designed by Hat-Trick Design and were printed by International Security Printers. in 2018. With the gracious blessing of the sculptor herself, the stage and screen actress, Miss Hazel Penwarden, the Richard Burton Museum has been given the honour and privilege of becoming the custodian and guardian of this incredible work of art. Sculptured in terracotta, Miss Penwarden, who appeared on stage alongside Richard Burton at the Shakespeare Memorial Theatre, Stratford-Upon-Avon, has captured perfectly the young Richard Burton in a rare moment of stillness and repose during his powerful and passionate portrayal of Henry V in 1951. More details relating to this beautiful statue will appear shortly on the newly created, 'The Hazel Penwarden Sculpture' page of this website. On ​November the 19th of this year Parthian Books launched the fabulous publication entitled, 'Ugly, Lovely: Dylan Thomas’s Swansea and Carmarthenshire of the 1950's', a photographic memoir, edited by Hilly Janes, the daughter of Dylan Thomas's great friend, the artist Alfred Janes, and the author of the wonderful 2014 publication, 'The Three Lives Of Dylan Thomas'. The book is based around the photographs of Hilly's aunt, Ethel Ross and is a delightful compilation depicting images of the influential Dylan Thomas locations found around Swansea, Laugharne and Carmarthenshire. The stunning photographs, captured by Ethel Ross just a couple of years after the death of her friend Dylan Thomas, capture the locations when they were still as he would have known them and are accompanied by related quotes from Dylan Thomas’s own poetry and prose as well as her own recollections and comments. The book launch was held at the Dylan Thomas Centre and included a talk from Hilly Janes, Richard Lewis Davies from Parthian Books and Professor John Goodby. The trio discussed how the book came to fruition and how Hilly Janes discovered the photograph album in her home and decided it would make an interesting, important and informative book, particularly to Dylan Thomas enthusiasts and scholars. The launch proved insightful for everyone involved as members of the audience also provided fantastic information and history relating to some of the places photographed in the book. At the book launch the Fluellen Theatre Company performed 'Lunch at Mussolini's', a little-known Dylan Thomas script which Dylan Thomas himself gave to Ethel Ross in the 1930s, and which is also published for the first time in this book. The South Wales Evening Post publicised the book launch, giving some background information on Ethel Ross and how she knew Dylan Thomas, alongside a quotation from Robert Francis-Davies, Swansea Council's cabinet member for enterprise, development and regeneration, "Combining with the Dylan Thomas Exhibition at the Dylan Thomas Centre, Saturday's event will once again celebrate Dylan's proud links with Swansea and other parts of South Wales that he drew so much inspiration from for his world-renowned writing." More information on this wonderful publication can be found on the 'A Dylan Thomas Treasury' page of this website. 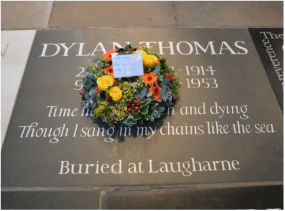 The annual Wreath-Laying Service, performed in homage to Dylan Thomas, took place this year on Saturday the 12th of November. As always, an incredibly moving service was held at Dylan Thomas's Memorial Stone in Poets Corner of Westminster Abbey, which was led by Canon Davis Stanton on the 63rd anniversary of Dylan Thomas's death. Beginning with an opening prayer, the ceremony continued with a reading given by Geoff Haden, Chairman of the Dylan Thomas Society of 'Song Of The Mischievous Dog' which was the first poem Dylan Thomas ever had published, in the Swansea Grammar School Magazine in the December of 1925 when he was just eleven years old. Following a performance of 'Being But Men' by the Dylan Thomas Sound Experience, Guy Masterson, actor and performer of many of Dylan Thomas's works, who also happens to be Richard Burton's nephew, read a moving and powerful rendition of 'And Death Shall Have No Dominion'. The wreath laying took place by Charlie Jackson, Dylan Thomas's great -grandson, after he had read a short and delightful rendition of an extract of 'A Child's Christmas In Wales' which was followed by the incredible singing voice of Trefor Ellis, Dylan Thomas's son-in-law, performing his version of Eli Jenkins' Sunset Poem from 'Under Milk Wood'. This moving service closed with prayers, both in English and in Welsh, and proved, once again, to be a beautiful and apt tribute to the finest and best loved Welsh poets of his generation. My gratitude goes to Andrew Dally of 'The Dylan Thomas News' website who provided me with the above programme for the event. My thanks also go to Guy Masterson who very kindly signed the programme alongside his contribution to the event. Images of the Memorial Stone and the 2016 Wreath-Laying Ceremony are credited to Andrew Dally of 'Dylan Thomas News', who very kindly gave his permission for me to display them on this website. Sadly, it has been known for many years that apart from some audio sequences, and a cinematic recording from the 1964 performance of 'Hamlet', no video footage of Richard Burton's theatrical performances were recorded professionally or have survived. 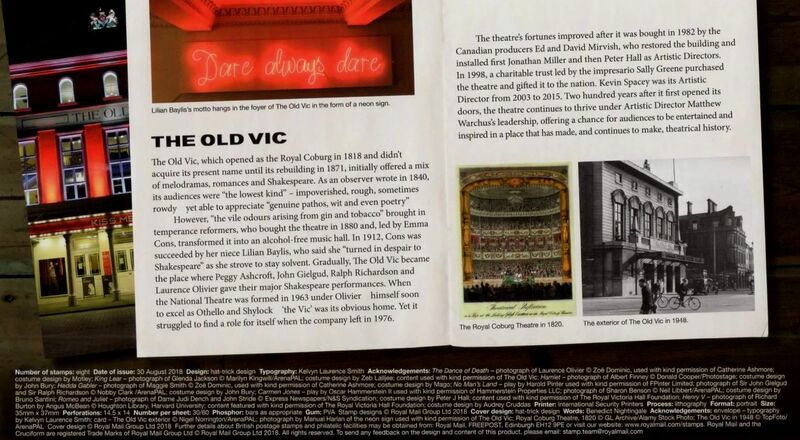 Video footage from the Old Vic or the Globe Theatre would have been wonderful to see, not just from an enthusiast of Richard Burton's life and career's point of view, such as myself, but from a student of the theatrical arts side as well. An immense amount of theatrical technique, such as timing, phrasing and professionalism could have been learnt from students watching some of Richard Burton's performances, especially of Shakespeare, Marlowe and Christopher Fry. Lamentably, the original Broadway production of the Lerner and Lowe musical 'Camelot' from 1960 was never professionally recorded, aside from some carefully staged performances recorded especially for the Ed Sullivan Show, and it has long been thought that no recording of the 'Revival' production of 'Camelot' from 1980 was recorded for posterity either. However, some marvellous footage, nearly the complete recording of the musical, has appeared on the internet. Although shaky, and with poor sound quality, having been recorded on a home video camera from a seat in the audience, it is an incredible record of Richard Burton in fine form in the role of King Arthur, which he had originally made his own twenty years previously. It is certainly a wonderful find for the Richard Burton Museum, and an unofficial DVD copy of the performance is now held in the Museum collection. We would be delighted to know where and when this recording was made, so if the person who uploaded this delightful footage would be kind enough to contact us, we would be extremely grateful. In September this year, the world of Theatre, Literature, Cinema and the Arts sadly lost one of the most talented writers of the twentieth century, the controversial playwright, Edward Albee. Born in 1928, Edward Albee was a Pulitzer Prize winning writer who achieved notoriety as one of the foremost experimental writers of his age who single-handedly re-invented post-war American theatre in the early 1960's. Edward Albee however, will always be remembered for his most famous work, 'Who's Afraid Of Virginia Woolf? ', the ground-breaking play which also created shock-waves throughout American cinema. 'Who's Afraid Of Virginia Woolf?' made it's Broadway debut in 1962 before being made into the 1966 Award-winning film which starred Richard Burton, Elizabeth Taylor, George Segal and Sandy Dennis. The film version of the play is also notable as being the first of only two films ever to be nominated in every eligible catagory of the Academy Awards. 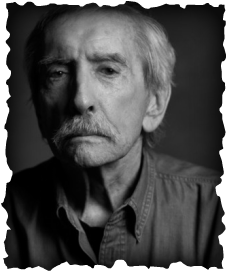 Edward Albee passed away peacefully at home in New York on the sixteenth of September 2016. He was eighty-eight years old. With the kind assistance of Jeff Towns, the 'Dylan Thomas Guy' and owner of Dylan's Bookstore, on the 28th of July I had the greatest pleasure and privilege of meeting a wonderful and delightful lady, Mrs.Gwen Watkins. Mrs. Watkins, one of the few surviving people who knew Dylan Thomas well, is well known among Dylan Thomas enthusiasts and Welsh literature and poetry historians as being the widow of the 'Pennard Poet', Vernon Watkins. A delightful afternoon was spent in her entertaining company where I had the honour of hearing many stories relating to Vernon Watkins' friendship with Dylan Thomas and her own recollections of their special friendship. 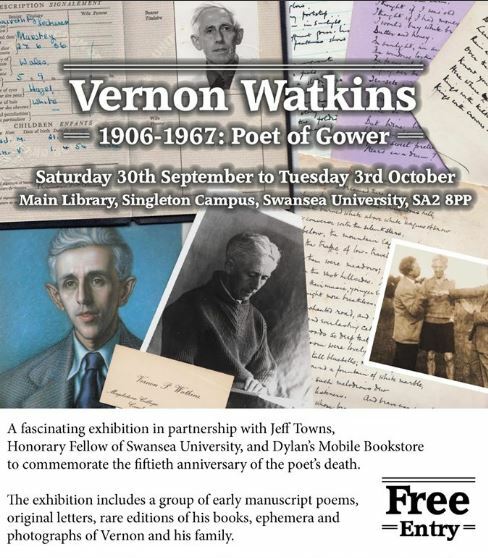 I was also given the privilege of seeing some of Vernon Watkins' personal papers and drafts of his poems which Mrs. Watkins is in the process of preparing to donate to the British Museum, where they will be able to be viewed by a worldwide and appreciative audience. Mrs. Watkins was also gracious enough to sign for me many of the Vernon Watkins books which are held in the Richard Burton Museum collection, including a 1957 first edition copy of the J.M. Dent / Faber and Faber publication 'Letters To Vernon Watkins' and his own personal collection of poetry published by Faber and Faber entitled 'Fidelities'. Both these signed copies now have pride of place in the 'A Dylan Thomas Treasury' section of the Richard Burton Museum collection. The 19th of February 2016 saw the long-awaited re-release of Sir George Martin's beautifully produced version of Dylan Thomas's 'Under Milk Wood'. ​Originally released on vinyl in 1988 on the EMI label, Sir Anthony Hopkins, was cast in the role of 'First Voice' alongside a host of Welsh stars which included Sir Tom Jones, Windsor Davies, Ruth Madoc, Bonnie Tyler, Nerys Hughes, Freddie Jones and Sir Harry Secombe. This exquisite version of 'Under Milk Wood' was produced by legendary Beatles producer Sir George Martin and under his guidance features a hauntingly beautiful musical score co-written by Sir George, Mark Knopfler and Elton John. This new double CD release is issued in a cover which exactly replicates the original 1988 vinyl and audio tape versions, even down to the lavishly illustrated and detailed booklet which was issued with the first release. This is an outstanding and long-awaited release by Parlophone Records and The Warner Music Group and it has been made even more poignant as the world lost the genius that was, and will always remain, Sir George Martin, less than a month later, on March the 8th 2016. More information on this release will appear shortly in the recordings section of the 'A Dylan Thomas Treasury' page of this website. The Richard Burton Museum regrets to announce the sad passing of Graham Jenkins on the 10th of December 2015. ​Graham was born on the 25th of October 1927 in Pontrhydyfen, the thirteenth child of Edith and Dic Jenkins, and was the younger brother, by two years, of Richard Burton. Whilst his older brother was developing his acting skills, Graham focused on his fine singing voice, and by the time he was thirteen he had already won over two hundred Eisteddfods, earning him the worthy title of 'Boy Wonder Soprano'. Very similar in build and looks to his famous elder brother, Graham was often called in to double for Richard Burton in many of his films, most famously in the 1963 Metro-Goldwyn-Mayer film of 'The V.I.P's'. After completing National Service in The Royal Navy Graham forged a highly successful career in sports management, joining the B.B.C. in 1977 as an organiser for radio sport and outside broadcasts. Following his retirement Graham moved to Porthcawl and in 1986 wrote the splendid memoir entitled 'Richard Burton - My Brother', a signed copy of which has pride of place in the 'Books and Magazines' section of the Richard Burton Museum website. ​The Richard Burton Museum would like to offer our deepest condolences to the Jenkins family and to Graham's many friends at this sad and difficult time. Published on November the 10th, on what would have been Richard Burton's 90th birthday, was this fascinating and insightful account of the history of a very special town in South Wales, Port Talbot, and the incredible amount of theatrical talent it has produced over the years. Published by Parthian Books, the publishers of Jeff Town's remarkable Dylan Thomas book 'A Pearl Of Great Price', is a completely new and different kind of book..'The Actors' Crucible'. ​Very few biographies of Richard Burton have focused on the origins and influences that shaped and created the then Richard Jenkins to become the 'Superstar' Richard Burton. It was in fact his surroundings, Port Talbot and Taibach which first gave Richard Burton his drive and ambition and also the certain characters that he was fortuitous to meet along the way, such as Philip Burton, Meredith Jones and Leo Lloyd, all from Port Talbot, who moulded him into the fine Shakespearean actor he was to become in the 1940's and 50's. Angela V. John, herself from Port Talbot and friend of the Jenkins family, takes the reader on a journey of discovery, not only focusing on Richard Burton but the many other talented actors from this small industrial town, names such as Anthony Hopkins, Michael Sheen, Ronald Lewis, Ivor Emmanuel, Rob Brydon and a host of new and rising stars who are beginning to make a name for themselves in television, film and on the London stage. 'The Actors' Crucible' puts centre-stage the shifting fortunes of, to use the words of Dylan Thomas, and to compare Port Talbot to Swansea, an 'ugly, lovely town', the actors created there and it's enablers. It provides a refreshing way of looking at the social history of a community, and a profession, as well as casting an unexpected and illuminating new light on the backgrounds of the 'stars' of stage and screen it has produced. A first edition copy of this fascinating and beautifully written and illustrated book was kindly, and very generously, donated to The Richard Burton Museum by Parthian Books and the author herself, Angela V.John, in recognition of the Richard Burton Museum's support and promotion of this publication. Also to mark what would have been Richard Burton's 90th birthday on November the 10th, was the unveiling of this beautiful and unique portrait of Richard Burton by talented artist Ed Chapman. The mosaic, using 500 million year old slate from the disused Rhiwbach Quarry in Conwy, was unveiled at an exhibition of the artist's work at the Corney and Barrow Wine Bar in Central London and is expected to be permanently displayed at Swansea University. Sally Burton has given full approval to this beautifully crafted image of Richard Burton, saying.."The portrait is a glorious creation from a very talented young artist." 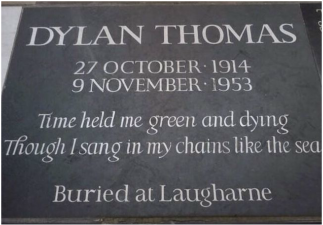 November the 9th 2014 marked the 61st anniversary of the death of Dylan Thomas at the St. Vincent's Hospital, New York City. The centenary year however was a celebration of Dylan Thomas's birth, life and work and his untimely death, at the age of just thirty-nine, the circumstances that surrounded it and the 'myths' that continually haunt this great man were thankfully overshadowed by the focus on his birth and legacy, rather than the sensationalism of mythology. The centenary year saw events held not just in Swansea and Wales but worldwide,which went to prove how vitally important a literary figure Dylan Thomas was during his lifetime, an importance which remains so to this day. Jeff Towns and the Dylan Thomas Society of Great Britain.. Geoff Haden and Matt Hughes and all the staff at the Dylan Thomas Birthplace, Cwmdonkin Drive, Swansea..The Boathouse, Laugharne.. Andrew Dally of Dylan Thomas News..all the staff at The Dylan Thomas Centre in Swansea.. Pierre Donahue and everyone involved with the 'Do Not Go Gentle' Festival.. all the contributors at Poetshub and everyone involved with DT100. ​The year was also made memorable for me by all the people, Dylan Thomas and Richard Burton related, who were kind enough to follow the Richard Burton Museum on Twitter, and who continue to do so. The centenary of the birth of Dylan Thomas and the filming of the 1972 Timon film version of 'Under Milk Wood' was celebrated in the beautiful seaside town of Fishguard, West Wales, over the weekend of the 26th and 28th of September 2014. Highlights of this event included screenings of the 2008 film 'Edge Of Love', starring Matthew Rhys, Keira Knightley and Sienna Miller and also the 1972 Timon Film production of 'Under Milk Wood', which was filmed in the town and starred Richard Burton, Elizabeth Taylor, Peter O'Toole and a host of 'big name' Welsh actors and actresses. Following the screening of the 1972 production there was a 'Question and Answer' session with the director, Andrew Sinclair. The weekend also included a guided walking tour of the town as well as a display of 'Under Milk Wood' memorabilia, some of which had previously been unseen, and a performance by local amateur actors of Dylan Thomas's delightful short story 'The Outing'. The Theatr Gwaun Bar in Fishguard also presented a screening of the marvellous Andrew Sinclair film 'Dylan On Dylan', which was hosted by Tony Earnshaw, Mark Davis and Andrew Sinclair himself. ﻿﻿To mark the 30th Anniversary of Richard Burton's passing, B.B.C. 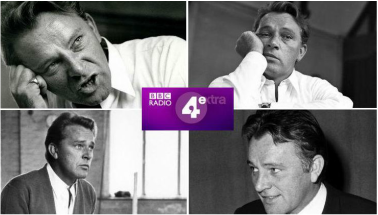 Radio 4 Extra broadcast three rarely heard radio performances which Richard Burton had recorded for the B.B.C. early in his career, over the week commencing the 5th of August 2014.
followed by Richard Burton's thrilling performance in the Louis MacNiece play 'The Dark Tower,' which was originally broadcast on the 14th of May 1956. Finally, one of Richard Burton's earliest radio performances, and possibly one of the finest in which he appeared, the Emlyn William's play 'The Corn Is Green', which was first broadcast on 'Saturday Night Theatre' for the B.B.C. Home Service on the 27th January 1945, and which was produced by Philip Burton. For just a short while, Dylan Thomas's notebooks returned home to Swansea and were on display from the 31st of May until August the 31st at The Dylan Thomas Centre, Swansea. On loan from The Poetry Collection of the University Libraries of the University of Buffalo and the State University of New York the collection comprised of the four notebooks and red prose notebook in which Dylan Thomas filled with poems and stories between the years 1930 and 1934. This was the first time the notebooks had been on Welsh soil since they were sold by Dylan Thomas himself in the 1940's. Other supporting material on display during the 'Notebooks Exhibition' included letters written by Dylan Thomas which referred to the notebooks, the poems they contained and the processes which Dylan Thomas went through in their composition. A hand drawn 'self-portrait' in coloured pencil which Dylan Thomas had sent on the back of an envelope to his early girlfriend Pamela Hansford-Johnson was also on display for the first time. The specially chosen room in which the notebooks were displayed at The Dylan Thomas Centre, Swansea, was further enhanced with the inclusion of various portraits of Dylan Thomas and his contemporaries by artists such as Fred Janes and Ceri Richards, kindly on loan for this momentous occasion from the Glynn Vivian Art Gallery. 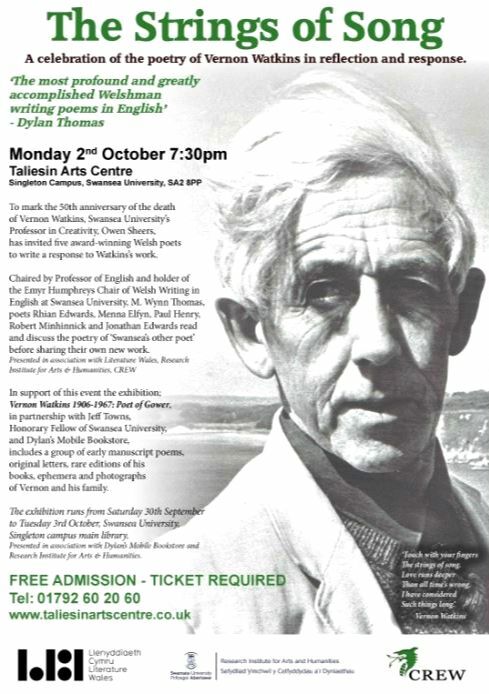 In the continuation of the Dylan Thomas Centenary Celebrations the Chairman of the Dylan Thomas Society of Great Britain, Jeff Towns, recently put together an exhibition entitled 'Dylan Thomas And The Mumbles', which ran from the 4th until the 30th of August at the Oriel Bach Gallery, 4 Dunns Lane, Mumbles. In conjunction with this there was a screening of the 1972 Timon Film adaptation of 'Under Milk Wood', directed by Andrew Sinclair and starring Richard Burton, Elizabeth Taylor and Peter O'Toole. This was held at the Ostreme Centre, Newton Road, Mumbles on Friday the 18th of July 2014. The Lighthouse Theatre Group gave a short light-hearted tribute to Dylan Thomas prior to the screening. 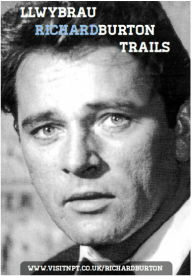 To commemorate what would have been Richard Burton's 87th birthday on November the 10th 2012, the Neath and Port Talbot Borough Council devised and put into place 'The Richard Burton Childhood Trail'. Designed to run in conjunction with the excellent 'Richard Burton Birthplace Trail' in Pontrhydyfen, this walk takes place in Taibach and focuses on the town and the locations where the young Richard Jenkins spent his childhood and formative years. Highlights of the walk include a visit to the house in Caradoc Street where he lived with his beloved sister Cecilia and her husband Elfed James, the Eastern Elementary School, the Co-Op store where he once worked, Philip Burton's lodging house and the dedicated flower-bed in Talbot Memorial Park. For more information click on the visitnpt.co.uk website on the 'Links' page of this website. A downloadable trail leaflet featuring both the Pontrhydyfen and Port Talbot walksis now available. The Swansea book launch of the superb 'The Richard Burton Diaries' was held at the Taliesin Arts Centre, Swansea University on the 28th of November, 2012. During the event there was a special screening of the Franco Zefferelli 1967 film adaption of William Shakespeare's 'The Taming Of The Shrew', starring Richard Burton and Elizabeth Taylor, which included a special introduction by the editor of the Richard Burton Diaries, Professor Chris Williams. All enquiries regarding the Richard Burton Diaries, such as appointments to view them, should be made to the Swansea University Richard Burton Archives. A documentary regarding the diaries and their publication was shown on B.B.C. One Wales on the 12th November 2012, a documentary which featured archive clips of Richard Burton and dramatized readings from the diaries as well as interviews with Robert Hardy, Melvyn Bragg and Professor Chris Williams himself. 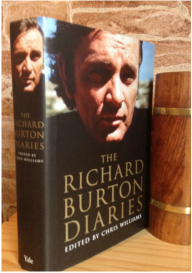 ​The Richard Burton Online Museum was very grateful to have received a pre-publication copy of 'The Richard Burton Diaries' thanks to the Yale University Press.